Christmas & Chorlton's Garage, Bottesford High Street: Billy is peering out from inside the garage door. My dad used to have an account at Billy Christmas’ Garage. He’d fill up regularly and get repairs done there for years. I remember getting my new ‘Trent Tourist’ bike from there! Here’s a tale Billy used to tell, can’t say if it’s true and I won’t name the village copper. I thought it would go well in verse. Ian Abbott. Silver white hair that once had been fair, down below was his shiny black boots. The garage was lived in and dingy, with a floor of trodden down grime. It didn’t seem strange, no need to change. That’s how garages were at the time. He’d fixed cars for years in the village, back to Bull Noses and model T Ford. He would make, fix or fit all manner of kit and any spare parts he would hoard. Behind the green sliding doors was his empire, his work, his life, his domain. He could mend and invoice your broken Rolls Royce or the link in a bicycle chain. CASTROL, CHAMPION and LUCAS advertised like artists displayed. They were dull and grimy, if not a little slimy and the colours were starting to fade. In front of the green doors were his petrol pumps, supplying fuel to all near and far. 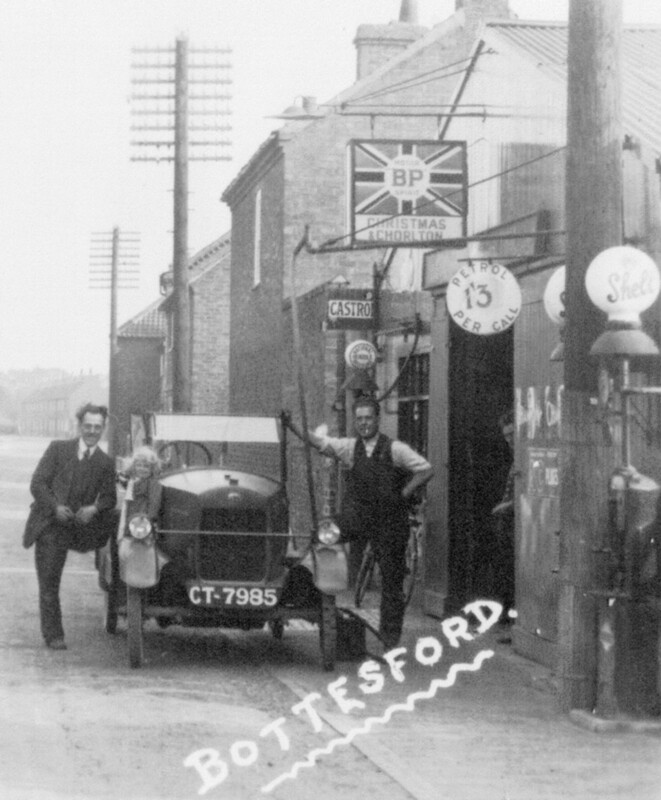 Their ESSO heads in blue, white and red supplied everyone’s tractor or car. An old hand pump was ignored and neglected it stood at the side quite redundant. No one would choose it, or want to use it now that electric pumps were so abundant. He’d sit and drink tea. (Perhaps it’s just me, but) … he seemed to be there day and night. Power-cuts those days were quite common, when everyone’s lights went caput. Billy would not shirk ‘cos pumps would not work no way could his garage shut. Billy looked at the car and the hand pumps long bar then started to roll up his sleeves. Plod was sitting up straight with his feet on a crate just behind the green sliding door. Now Plod was up to the challenge, his standing and manhood at stake. He rolled up his sleeves and started to heave, soon he knew he had made a mistake. If he pumped any more he’d be down on the floor, or even worse he’d be dead. But he couldn’t fail this public challenge, keep pumping make sure there’s no spillage. He just couldn’t lose face it’d be a disgrace, the laughing stock all round the village. The pumping got harder and harder, and slower he’d push and he’d pull. PC Plod collapsed in the corner, exhausted and red, what a sight. He made moaning sounds like he’d done fifteen rounds with Muhammad Ali in a fight. He stuffed the pound note, inside his coat, he knew that he’d win all the time. But Billy was honest and gracious, ‘I can’t take your money’ said he. This page was added on 16/04/2012.